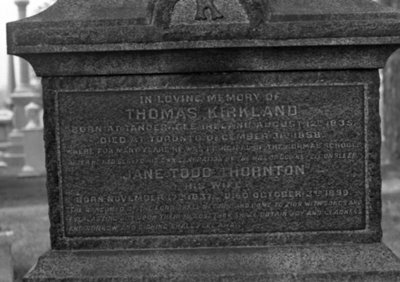 A black and white photograph of Thomas and Jane Kirkland's gravestone in Union Cemetery, Oshawa, Ontario. View is of the inscription on the gravestone. Thomas Kirkland Family Gravestone, Date Unknown, Brian Winter. Whitby Archives A2013_004_457D.